In order to secret our target protein to the extracelluar space, we added this lysis part to our project and design a series of experiments to prove the function of E7 lysis protein. 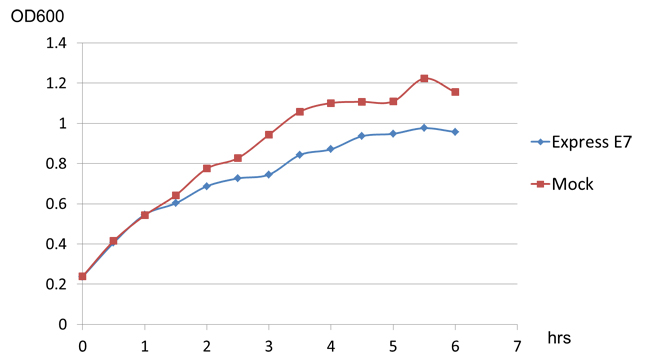 From chart1 we can see the obvious difference between induced and noninduced E7 strain 2 hours after induction, and the difference reaches about 1 fold 8 hours after induction, indicating that a large number of E.coli lyse because of the induction of E7. In order to exclude the possibility that IPTG itself may cause drop in the growth rate of E.coli, BB strain is used to conduct another experiment. From chart2 we can see that IPTG does have some influence to the growth of E.coli, but its effect is too weak to cause such a big OD difference in chart1. Thus it's safe to say that the expression of E7 is the main cause of w3110's lysis, but it can't kill all of E.coli even under such a strong expression. From the picture we get to know that normally DnaK can't be secreted to the outside of E.coli after expression, but when E7 is expressed, E.coli lyses and DnaK leaks to the extracellular space and thus can be detected in the supernatant, and its concentration increases over time, proving the function of E7 lysis protein. Besides those two main experiment to prove the funtion of E7 lysis protein, we also have an interesting discovery. When we transform E7 lysis gene into BL21, which can't secret colicin, we find that E7 lysis protein can still cause partially lysis in it, though the influence is not as strong as in w3110(the OD difference reaches about 0.5 after 10 hours of induction, see chart3 below). 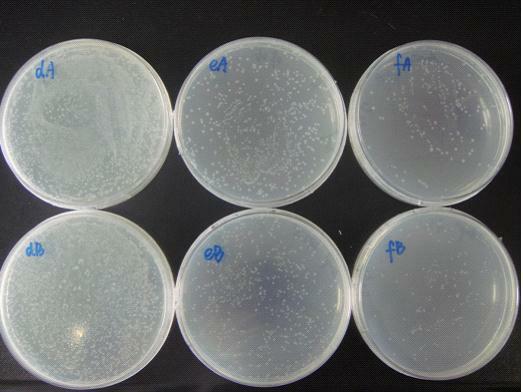 This result indicates that E7 lysis protein may also have function in noncolicin-secreted strain of E.coli, but it remains to be explained what's the mechanism of E7 lysis protein and what causes the different effect E7 lysis have on colicin-secreted and noncolicin-secreted E.coli strain. This Biobrick part is a Lysis gene. It can be ligated to the desired choice of promoter and lysis of the E coli cells could be acheieved. The NTU@iGEM did just that, and ligated this biobrick part to the pLsrA promoter which detect AI2, an auto-inducer molecule. After the pLsrA detects the AI2, the promoter promotes the transcripton of the lysis gene. Next translation takes place and the lysis protein is formed. Lysis protein would lyse the cell by the destruction of the cell membrane. For more detail description of our the Lysis part was used by the NTU@iGEM team, please visit: NTU@iGEM Team Main Page. This part we use R0010 promoter ,it is to say in the absence of LacI protein and CAP protein, it promotes transcription,in the presence of LacI protein and CAP protein, it inhibits transcription. 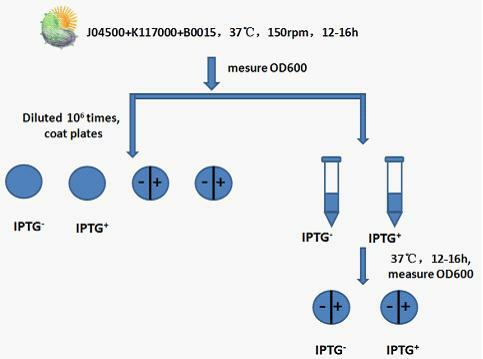 When induced by IPTG, the protein expression begin. Step 1: Recovery J04500+K117000+B0015,shaking it in 37℃ for 12 to 16h at 150rpm. Step 2: Measure the OD600 of bacterial liquid. Step 3: Use 50ul bacterial liquid which has been diluted times to coat plates.Set IPTG(none or 1mM) control. Step 4: Add 5ul bacterial liquid which has been diluted times to 5ml liquid Luria-Bertani medium. Set IPTG(none or 1mM) control. After cultivate in 37℃ shaking(150rmp) for 12 to 16h,measure the OD600 of bacterial liquid . Step 5: Use 50ul bacterial liquid(from step 4) which has been diluted times to coat plates. Set IPTG(none or 1mM) control. 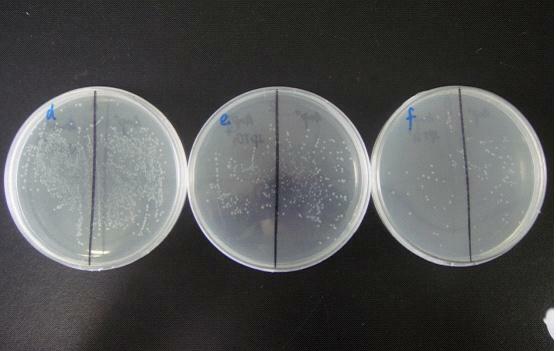 Step 6: Compare bacterial liquid concentration and petri dishes on the growth of the colony to judge lethal gene’s effects .Compare the bacterial concentration and Petri dish colony growth to judge the effect of lethal gene. Judging from the OD600 of bacterial liquid and the growth state of bacteria in Petri dish to see whether the death gene work or not. We can see from the figure that the bacteria caring the death gene is in bad condition comprared to the one without . We conclude that the death genes work. For more information on how this part operates in our system, please visit SEU_a Team Main Page.